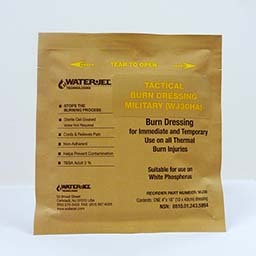 Water-Jel sterile gel-soaked 4"x16" tactical burn dressing for immediate use on burns. A well-suited dressing for the inner or outer area of the forearm. Can also be used on a portion of the leg or to wrap a foot. Used in first aid survival kit used by military personnel.